Preheat oven to 475. degrees F.
If using refrigerated pizza dough, remove dough from refrigerator and allow dough to come to room temperature while oven preheats. Place dough on a lightly floured surface. Roll out into a circle shape. Make a thicker crust along edges of pizza. Sprinkle cornmeal on stone or pizza pan (to prevent sticking) and place pizza on top. 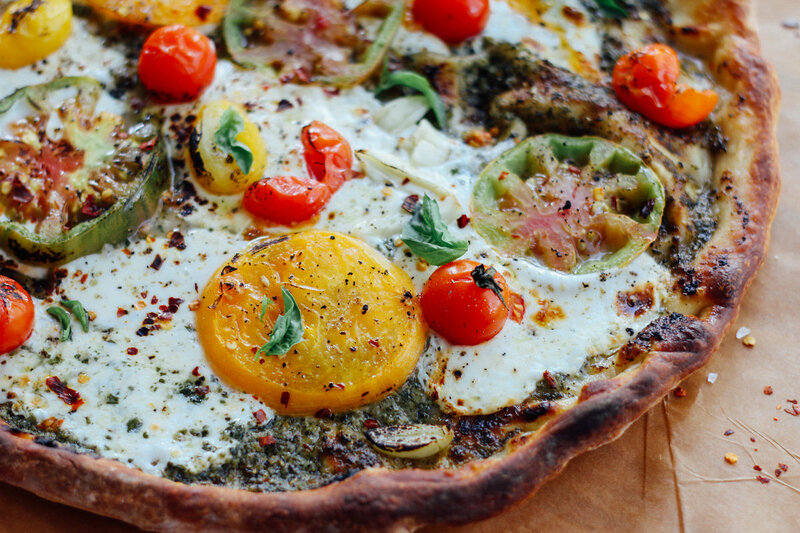 Brush pesto over dough and assemble pizza with mozzarella and tomatoes. Season with salt and pepper, to taste. Transfer pizza to oven and bake for 12-15 minutes or until crust is browned and cheese is bubbly. Remove pizza from oven and drizzle with balsamic glaze (if using) and garnish with fresh basil. Combine water, yeast and sugar in a measuring cup. Stir gently; let stand until it’s active and foamy, approximately 5-6 minutes (this is called “proofing” the yeast). Add salt, oil, and 2 cups of flour to the mixing bowl. Attach the dough hook to the stand mixer. Stir the flour mixture gently while adding the proofed yeast mixture. Run the mixer on low speed until the mixture is combined and wet and then add the third cup of flour. The mixture should come together into a ball that is just a bit sticky. If your dough is too wet, add up to 1/4 cup more flour and if it’s too dry add a little bit of water (1 tablespoon at a time) until dough is smooth and elastic. Poke it with your finger - if it slowly bounces back, your dough is ready to rise. If not, keep mixing. Shape the dough into a ball and place in a large mixing bowl that has been coated lightly with olive oil. Turn it over to coat all sides. Cover tightly with plastic wrap and place in a warm area of the kitchen and let rise until doubled in size, about 1-2 hours. Punch the dough down to release the air. Divide the dough into two parts. Roll each half into a ball and let rest in two separate bowls lightly covered for 15 minutes. Turn out dough onto a lightly floured cutting board or clean counter. Sprinkle with more flour if needed so you can stretch and flatten the dough into your desired size. Blend the basil, pine nuts, cheese, garlic, salt and pepper together in a food processor or blender. Pour oil in slowly while still mixing. Scrape down the sides, add lemon juice. Pulse until everything is blended together and relatively smooth. Taste and add more salt/pepper if needed.